Dark Horse and CD PROJEKT RED are excited to flesh out the world of The Witcher with a new comic miniseries, The Witcher: Of Flesh and Flame! Written by Aleksandra Motyka (The Witcher 3: Wild Hunt) with art by Marianna Strychowska (The Caravan, Duplicant), The Witcher: Of Flesh and Flame is the debut creation of this talented creative team. 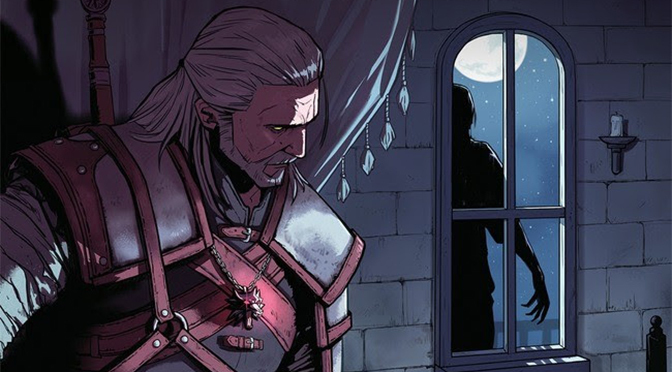 In The Witcher: Of Flesh and Flame, Geralt is summoned by an old friend to help solve a mystery involving his daughter. Upon his arrival, Geralt is surprised by another friend from the past, and he soon finds himself transported to regions beyond his original expectations. The Witcher: Of Flesh and Flame #1 (of four) goes on sale December 19, 2018, and is available for pre-order at your local comic shop. The Witcher fans can catch up on previous stories in The Witcher Library Edition ahead of The Witcher: Of Flesh and Flame’s release. The Witcher Library Edition goes on sale October 24, 2018, and is available for pre-order on Amazon, Barnes & Noble, and at your local comic shop.